Habit 1 of 7 Habits Of Highly Effective People is the cornerstone for all of the other Habits Of Highly Effective People. Habit 1 is about personal empowerment and being responsible for the decisions we make. It’s about how we live and how we engage with ourselves… and the people / world / work around us. Stephen R. Covey believes many of us have learned to react to our feelings – our moods – our thoughts. A reaction is an involuntary response – one we didn’t think about. Instead, habit 1 of 7 Habits Of Highly Effective People suggests we need to learn how to actively (or proactively), choose to respond – and to be accountable for this choice. As Zindel Segal and Jon Kabat-Zinn (leaders in the field of Mindfulness), might suggest, it’s a choice to be Mindful how we respond. Our ability to choose and to be mindful is one of our greatest human abilities. A closely related approach Stephen R. Covey looks at in 7 Habits of Highly Effective People is to ‘Act’ or be ‘Acted Upon’. If we wait for someone to tell us what to do (to act upon us), we absolve responsibility, choice and control; we become a follower. You can identify when someone has given up control when they start sentences with, “I had no choice…” or “I have to…” Sentences like this give away almost all of our ability to be a powerful influence and to experience creative, independent thought. Example: Your company downsized and you lost your job. You can see it as an opportunity for diversity and to upgrade your skills, change your Linkedin profile and sell yourself to high-potential new employers. Sure, getting laid off is often awful, yet I agree with Stephen R. Covey when he suggests that in any circumstance we have choice whether the pain will be short term or long term. Our former employer is not responsible long term; we are. Only we can shape how we respond to a circumstance; only we have the choice to respond in a way that demonstrates our proactive choice and leadership. Is being proactive easy? No, Habit 1 of 7 Habits Of Highly Effective People takes work to master and often takes coaching. Challenging events will always happen around us that we cannot control so… we will always have opportunities to practice. This all seems like a great idea but you might be asking, “How do I know where I should be spending my time?” Stephen’s ‘Circle of Influence’ identifies where you can make a difference. It can also mean empowering the people around you and turning them into positive leaders. 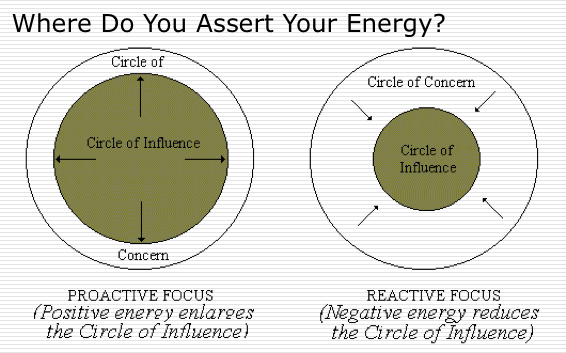 I discuss ‘Circle of Influence’ within my Time Management training. Where do we have influence? What do we choose to be, do and feel from this moment forward? It’s up to us if we are happy at home, successful at the gym, influential at work. This is our ‘Circle of Influence’. Example: There are things like the weather we are never going to change – our circle of influence has no influence – but we can change our response to the weather. 7 Habits of Highly Effective People suggests our circle of influence helps us respond to the things that will have positive impact. I can listen without interrupting or making judgments. I can listen with empathy. I can validate what I understand they said they need / want. I can identify other needs they may have that they don’t realize they have. I can stop complaining and be proactive. Focus on influence you will increase success. 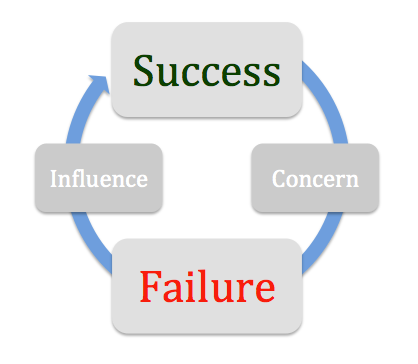 Focus on concern you will reduce your influence and increase failure. This is further discussed in Habit 2 of 7 Habits Of Highly Effective People. Finally, if our choice is to influence things in a positive way there will likely be positive consequences. If our choice is to influence things in a negative way (rob a bank), the consequences will likely be bad – we will likely go to jail. We are able to choose how we respond and try to influence the consequence – but we cannot 100% predict and control a consequence (we might not get caught if we rob a bank). 7 Habits of Highly Effective People suggests that while we cannot control consequences, we do have to be responsible for them… whether those consequences are 100% predictable or not. Reactive people use their feelings. They let the circumstances or people around them control their actions. How we respond is always important. Even when you make a mistake, admit it, correct it, learn from it, be part of relevant proactive change and then move on. Happy communicating, creating workplace harmony and reducing employee turnover.